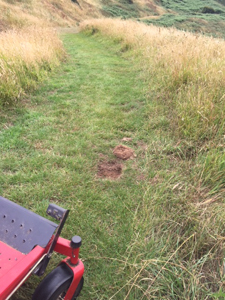 A few days ago, the landowner of the Drumshang to Dunure section of the Coastal Path, who kindly mows the cliff-edge path for us with his motor mower, was angry to find over a dozen holes dug in the cropped path surface by someone with a metal detector. With the dry weather the sods were shrivelled and loose. It is irresponsible behaviour of this type that risks us losing the goodwill of our landowner partners. The metal detector operators’ code is that they should always seek permission from the landowner before they use their apparatus, and cause no damage. Here, this was not done, and a footpath was damaged. 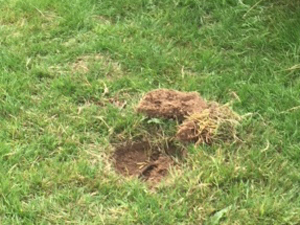 A man carrying a metal detector was seen on 27 July around 4.30pm, walking north along the road near Drumshang. If anyone saw him, or any previous incidents, and can provide more information, please contact us via the website or Facebook.